Before I walk on it. I typically don’t blog in photographs because I am not really much of a photographer, but the Eno River made it easy today. The air and the water were absolutely still, the sky deep cloudless blue, and the low angle of the afternoon sun coaxed a glow from the trees and the river that I can’t find words to describe. I can see why Monet spent a lifetime trying to paint light and reflections on water — and why he was never satisfied. 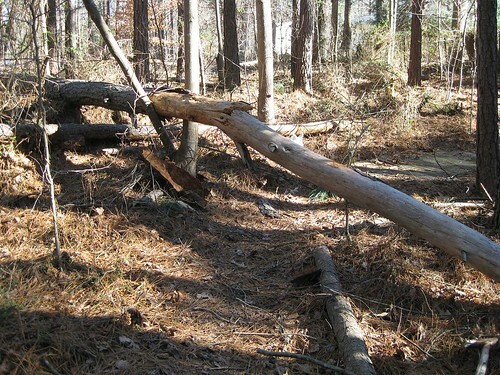 New Year’s Eve winds knocked down another big old loblolly pine across the nature trail, and so I had to start the year by playing lumberjack. This pine was just big enough to make a lot of work with the bow saw and just far enough from a power supply that my electric chain saw was no help, but it was rotten enough that the work went quickly. Two-thirds of the way through with the saw was enough, and then a good whack with the poll of an axe finished it off. I wasn’t about to repeat the process unnecessarily, though, so a freshly sawn cross-section of pine the diameter and height of an eight year-old’s head watches you coming round the bend. Our woods are at the age when the first-generation pines are dying off and being replaced by hardwoods, but in this little section of woods the secondary succession is going slowly, with only two skinny sweetgums in an area several yards square. That section is lower than the rest and stays wet much of the year, and I wonder if the trees in the surrounding woods simply don’t propagate well in such damp bottomland, or whether saplings are more easily felled by vines (we are overrun by fox grape and, until I started ripping it out last summer, oriental bittersweet) when their roots have only loose wet earth to cling to. Come spring I may try clearing out the tangle of vines and pine stumps down there and transplanting a few saplings that won’t make it elsewhere. Meantime the trail is clear, even if alongside is still a bit of a mess — but that’s the wild woods, and by June the foliage will have hidden it all anyway.